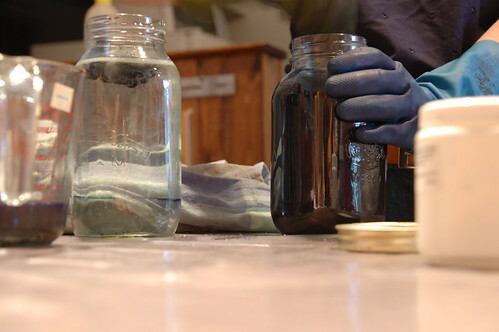 The last day of the Natural Dyeing class was all about indigo dyeing. 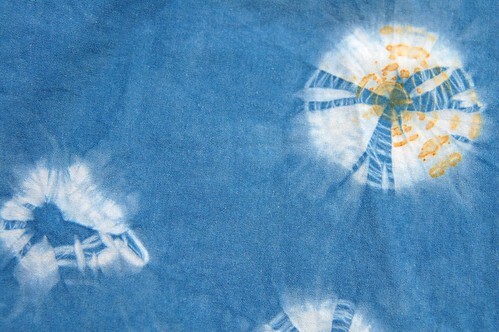 I’ve always admired Japanese shibori dyeing, so I couldn’t wait to try it out in this class. Shibori is a method of creating patterns on fabric during the dyeing process by binding, stitching, folding, twisting, or compressing it. I got the idea to dye fabric for a dress from Melissa and pre-cut and serged all my pieces beforehand. This way I could plan exactly where the shibori would be located on the dress. I used a pure white muslin rather than a natural coloured one to keep the blue clearer. 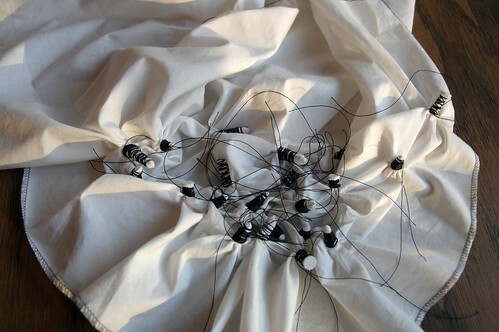 To create my design I placed screws (of various sizes and shapes) underneath my fabric and wrapped each one up tightly with heavy upholstery thread. This is a fairly labour intensive type of shibori, but I really liked the circular patterns it creates. Deeper blue colours are achieved through repeated immersion into the dye vat. I was able to dip my pieces into the vat four times. It’s a bit hard to tell what the colour will dry as, it is always much darker when it’s wet. When I unwrapped all the screws, several of them had transferred rust marks onto the fabric which I actually really like. 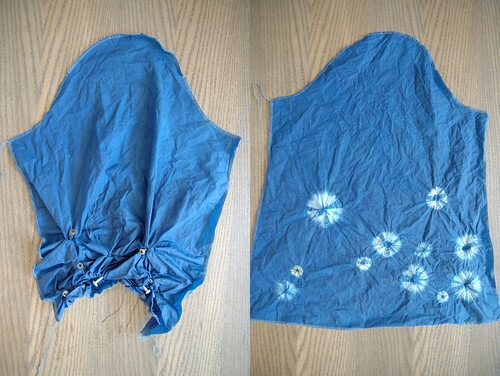 The fabric dried to a really nice blue and I even like the slightly uneven colouring, it gives it a vintage feel. Next post – the finished dress! STYLISH DRESS BOOK 2 : DRESS "V"
Were you wearing this on Saturday when I dropped in? I noticed your pretty blue dress but since you were busy teaching I couldn’t ask you about it. Your dyeing results are amazing, I will have to sign up for this next time. This is so beautiful! You make me want to learn more about natural dyes and techniques! Thank you!